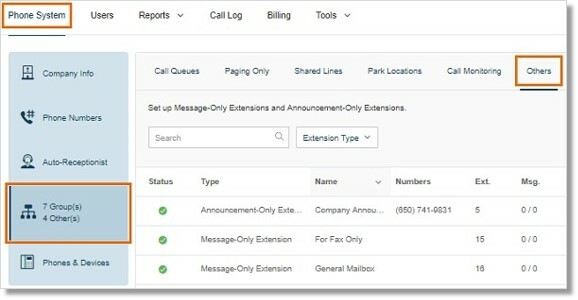 A Message-Only extension routes calls to be automatically directed to the extension’s voicemail box. This can be created by Account Administrators on the Office@Hand Online account. The Message-Only Extension is one that is dedicated specifically to receive messages. 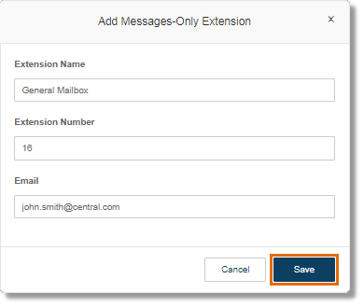 All calls routed to this extension will automatically be directed to the extension’s voicemail box. Log in to the Office@Hand Online account. Go to Phone System > Groups > Others. Click the drop-down below Others, then select New Message-Only Extension. Fill out the extension information, then click Save. Note: The instructions will be sent to the email address you indicated on the Email field.